what rear end do you have? I think everyone is over thinking this. That is a 0 offset rim. 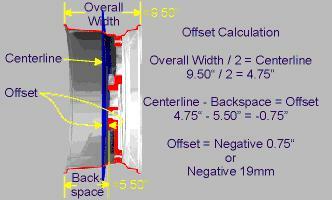 This is because the centerline of the rim is 4" (centerline = rim width/2) and the backspace is 4". Don't let the metric conversion to mm trip you up. An 8" rim with 0 offset would about 4.5" of backspace. I don't know if it has been mentioned, but for offset, the smaller the number (or more negative), the further out they stick out. Like the wheels on my truck have a -11 offset and I can see them clearly in my mirrors because they stick out a lot. +15 is more of a factory wheel offset and would sit inside the fenders. I have to say after reading this entire thread INFO OVERLOAD! When the factories started making the wheels more like hubcaps (like a new Camaro) they can't in my understanding be centered. The whole wheel seems to be all B/S the way it sits over the brakes toward the frame. Well, I just read the last few comments. My question would be, why don't they just reveal the backspace measurement, eg 5", 4.5", 4" etc.? What good is zero offset, or some other figure that describes offset? Many wheel ads only mention offset. Why would they want to confuse their customers? Wouldn't it be easier to understand to just use the backspace measurement? Inquiring minds need to know.